At the Sywell show over the Easter holiday in 1973, Peter Valentine came second in the first UK helicopter competition sponsored by RCM&E. This was Peter's second design of helicopter and had been flight proven; though not demonstrated at the show due to the very blustery conditions. It was though very compact and tidy looking and proved of interest to Micro-Mold. Peter's 'show' helicopter had to be redesigned with a view to commercial production and to utilise some of the already available Micro-Mold range of accessories. The helicopter was marketed with the name 'Lark' because it was an 'early bird' in the history of RC helicopters. 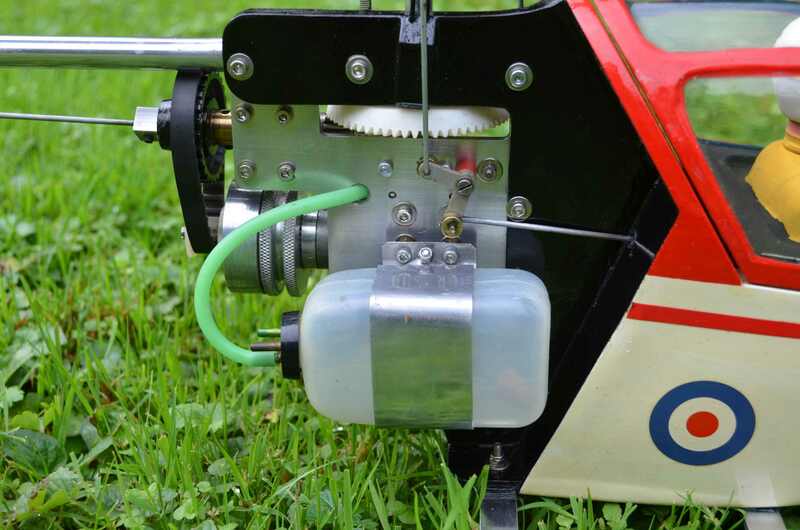 The design utilised the 'Standard' Hiller rotor head control with fixed pitch and construction was kept simple by utilising metal sheet, tubing, wooden bits plus a few machines parts and plastic moulded items. Unlike European manufacturers who used fibreglass fuselages with the resulting need for high power engines, the Lark was designed to be light as possible and thus only required a 'small' engine (19 to 25). The prototype was displayed and flown by Geoff Thompson (who carried out most of the prototype testing) at the 1974 Kempton park expo and was very well received as now it looked like helicopters were finally being made available (projected late Summer) at a price the 'average' modeller could afford. 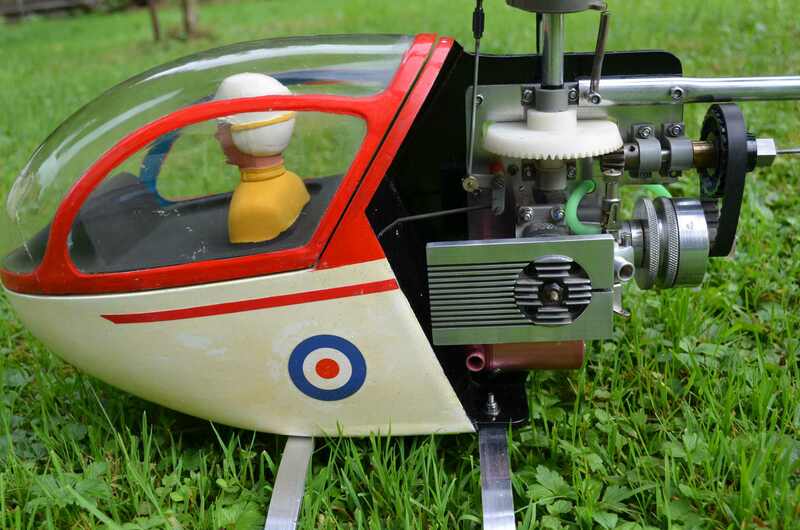 Flown again at the UK Nationals to a lot of interest and despite delays it was about to become available as noted by the advert in August issue magazine, which would have been out a few weeks before the Nationals took place. So, the production model was ready and as noted above the basic layout of the Lark was of the 'pod and boom' layout being the first commercial helicopter of this format with a 'single' main rotor. The 'body' was a flat plate to which was bolted the engine, transmission, tail boom, undercarriage and nose assembly. This later assembly made from plastic and wood held the servo's, receiver and battery which were very neatly covered by a 'mock' cabin with pilot. The 'skid' type undercarriage, in relation to full size helicopters, was wide thus making the helicopter very difficult to 'tip over'; this was a boon for both learning and when landing if not quite stationary 'over the spot'. 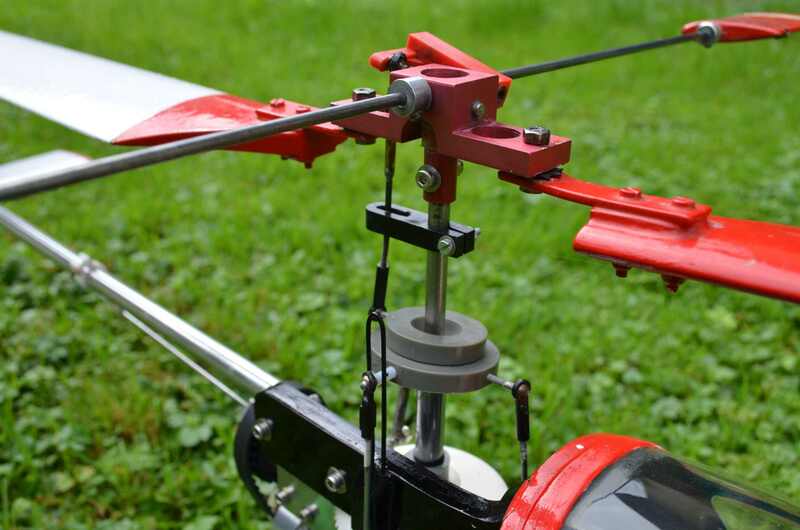 The blades were of the flat bottomed 'lifting' section, constant chord and locked at a fixed pitch with head control by 'Hiller' operation of the flybar; 'teeter' was not incorporated in the head thus making for a very simple layout. As the blades were at a fixed pitch, the blade holders were set to give a 'coning' angle thus removing the bending stress that would otherwise occur along the length of the wooden blades. A belt drive provided primary reduction and was driven through a centrifugal clutch on the flywheel. Secondary drive passed through gearing to the main shaft and also by wire drive down the tail boom to the tail rotor gearbox. The engine did not have any additional cooling and relied on the addition of a heat sink head and the downwash from the main blades. Commercial production of the Lark did have a few teething troubles and sorting these out resulted in delivery of kits being delayed until late Summer 1974 but for the cost of £60 for the basic kit (engine and radio gear extra) it was to prove a very successful helicopter. Lark 25 Instruction Manual - Build and theory of flying manual for the first version. The Lark was to engender a lot of respect and affection especially with its ability to absorb punishment and keep going and a letter I received in 2009 indicated perhaps the oldest continuous flying Lark in the World...??? This is my MM lark which was given to me for safe keeping and I have to keep it running for as long as I can then pass it on to some body else when I am no longer able to fly it. 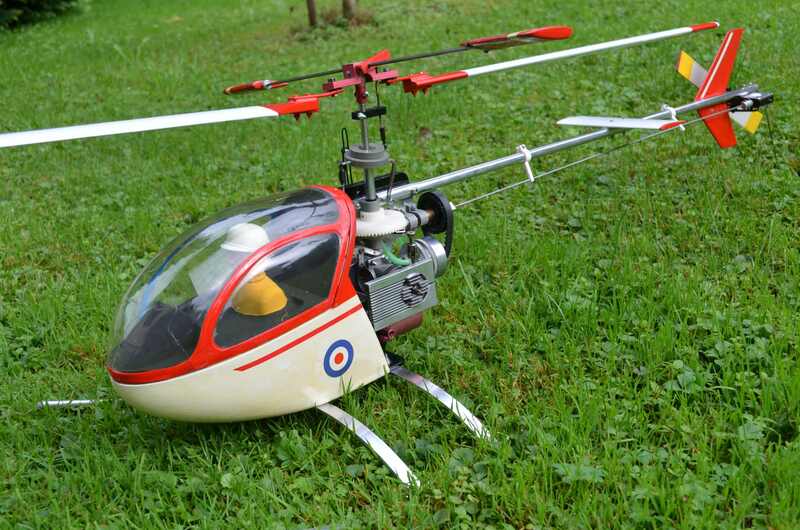 This was the FIRST R/C HELICOPTER brought into AUSTRALIA so one could say its priceless. It was purchased in 1974 and the serial # in the manual is LA 002202. It is a Mk1 Lark with the open gear box and though the airframe is original it has been updated over the years. A 153bb gyro was fitted followed by the original engine being changed to an OS 30. The radio set used is a Futaba Gold FG-7FGH. I'm the 4th owner of this helicopter as the original owner past away several years ago and that's why it gets handed on. MM Lark Pt1 - MM Lark Pt2 - First Lark UK magazine review by RCM&E Jan 1975. MM Lark - Review by RM Feb 1975; interesting additional heat sinks on the standard heat sink head. Two slightly different angles with the RCM&E reviewer a helicopter Tyro so greater detail given to the building and nothing more than test hovering in the flying section. 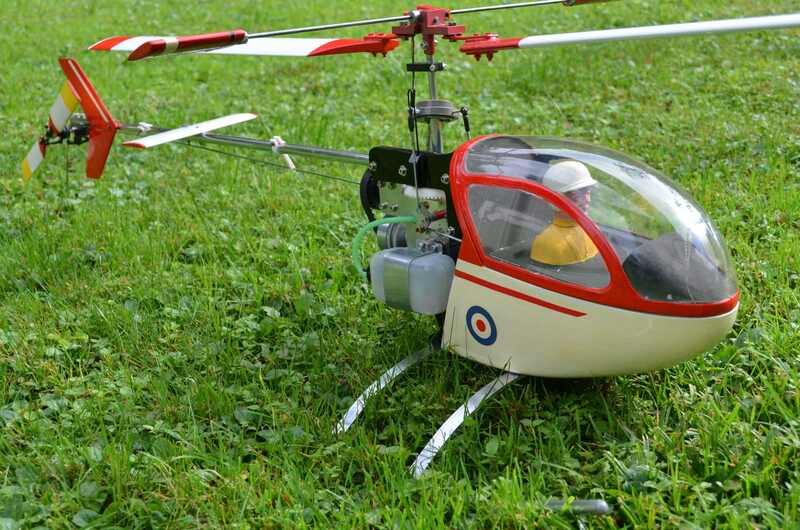 The RM reviewer Tony Bray was already a competent pilot having covered previous helicopter builds so the review has a little less detail but again the flying is just hovering. Both models built with 19 size engines that were considered powerful at the time and both reviews indicated no lack of available power with these choices. Noted to be very docile and comment by Tony that a teeter head would perhaps speed things up; watch this space. Starting also proved to be difficult having the Vee in the flywheel for the starting belt 'behind' the main drive belt. The trick was to removed the drive belt, start the engine and let it warm up then with a high idle set put the main drive belt back on without stalling the engine. It was a bit hit or miss if you had an engine with a poor idle as it would stall when trying to get the belt back on the upper pulley. Teesside Model Flying Club circa mid-late 70’s. Paul Furniss a well know character at TMFC and know to me through full size flying, occasionally dabbled with unusual flying things, was given a well used MM Lark when the owner finally gave up any hope of ever getting it off the ground. Paul turned up at the flying field on a cold winters Sunday afternoon much to the amusement and horror of the older members who frowned upon R/C helicopters. He spent several hours during the afternoon trying to get it in the hover and get the feel for it culminating in the model tipping over and breaking the blades. Everyone thought that would be the end of the noisy annoying thing and that the field would get back to normal. How wrong… next week Paul turned up again and spent most of the afternoon trying, failing, repairing (came prepared this time with spare blades), ending the day with no success other than a brief hop which ended when it struck Paul's leg causing some quite nasty bruising but his main concern being a bent main shaft. This time the other members were convinced that this would be the end of Paul's helicopter challenge. But no, week after week he turned up and couldn’t get it to hover and ending up at A&E when he lost control again and with the model coming back quickly at him he turned his back so the blades struck him squarely in the lower back. Lucky it was winter and he was well padded but his bruised kidneys caused some discomfort for several weeks. After a couple of weeks lay-off he returned, determined to get the little Lark into the air. Eventually he just wound open the throttle and the little Lark leapt into the air pirouetting madly until he could get some forward flight established. He flew around quite well saying that once it had transited to forward flight it flew and controlled just like a fixed wing. His landing was a semi controlled arrival in long grass to minimise the damage. Slight repairs, refuel and the same again, no thoughts of starting and ending a flight with a hover. This became a bit of a novelty act for several weeks until one afternoon, same procedure, wind open throttle, pirouetting to about twenty feet when it shed a tail rotor blade. The resulting severe vibrations had the model gyrating uncontrollably around the square making everyone dive for cover. Almost immediately the vibrations threw off the canopy quickly followed by the receiver battery. Now with no control at all and no way of closing the throttle the Lark was doing things for which a modern day 3D flyer would be proud. Flight finally came to an end after what seemed ages but in reality was just a couple of minutes when the fuel tank was thrown off the model causing the engine to cut. That was the final straw for Paul and the wreckage was bagged and stored at the bottom of his shed, possibly for future attempts………..
As you can see, In the mid 70's there were very few experts and so nearly everyone had to 'go it alone'. Like today, many failed and gave up though due to the quite reasonable repairs costs of a Lark, a large proportion of pilots did achieve competence. Training was split into two camps; the first recommended emulating aircraft thus allowing pilots to have some level of familiarity, the second recommended learning to hover and then move out from that to flying manoeuvres. With decades of hindsight we know that the latter is a better way of achieving competence but unfortunately in the Lark manual the former was promulgated and like in the example above was to some extend successful; depending upon the length of the grass to 'land' in. The nominated engine size was 19 to 25 and the initial development was carried out with a Veco 19 which was quite powerful. Unfortunately the cooling could let the helicopter down even with a heat sink head as on a hot summer day with a learner only hovering the engine would rapidly overheat, especially if set up like an aircraft engine (which was all fliers of the time knew) instead of running well rich. The Lark had by early 1975 had many reviews and an additional six months of use (and abuse) by the general modellers resulting in a number of suggestions and experiences being capture by Geoff Thompson (development tester) and produced below as addendums and additional information to go with the original lark Manual. 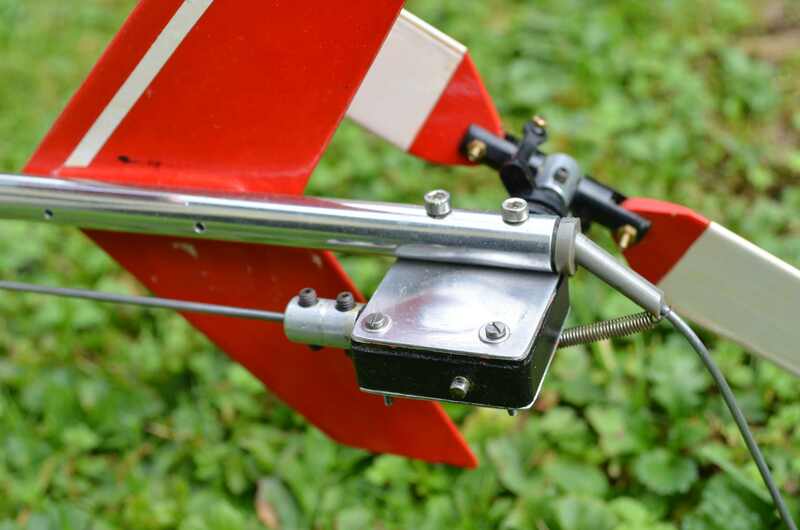 Another recommended upgrade is to increase the size of the bolts securing the tail boom to both the frame and the tail gearbox as they tend to shear with any vibration; 3mm max though as it gets very close to the tail drive shafts. 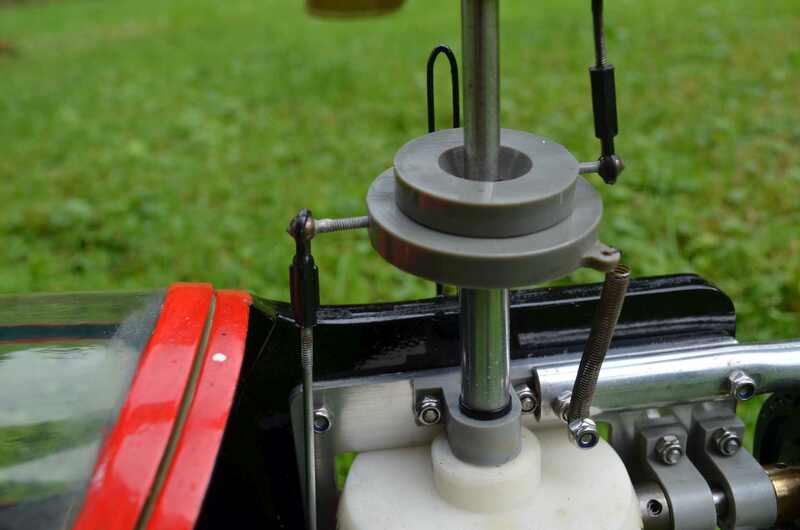 The later heads with teeter also flew better if the teeter was 'locked' by replacing the rubbers with plastic pieces. Geoff Thompson and '40' powered Lark looping; first in the UK? It had to happen eventually, on the principle that more is better then if a 25 is good, a 40 will be excellent. Read the review to find out about the first loop and also info on curing tail rotor vibration and 'porpoising' by fixing in about 5 degrees of lead to the main blades; this 'cure' is found on a number of full size machines such as the Lockheed Cheyenne. 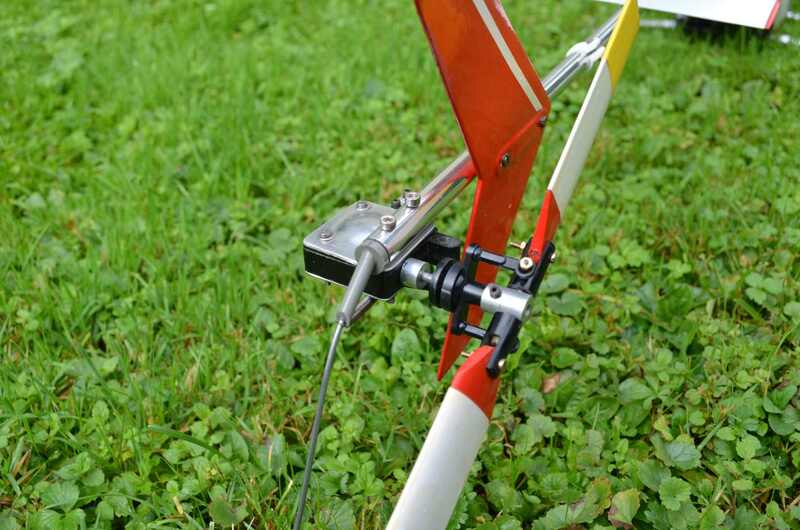 Note that Larks have 'locked' blades and must not be allowed to 'lead/lag' like later machines otherwise they can get unstable, additionally this problem is made worse by having a low hover rotor speed so it is better to have slightly less pitch and higher revs; this also improves both cyclic response and tail control. Odiham July 1975 and Lark in all positions for the under 20 size engine class; would be because it was at the time the only one available.!!! Note that Geoff came last with the 40 powered Lark... not perhaps too unexpected as without a gyro it was reported to be somewhat of a 'beast' in hovering and slow manoeuvres. Aug 1975; new teeter head now standard fitment in the kit and tapered blades also available. Old Warden and Nigel Brackley's semi scale Hughes 300 Lark with elevators for improved control response (Date TBC). Lark revisited - Oct 1975 update by Jack Barnard from RCM&E with modifications etc designed to make the Lark a better flyer. Elevators also on Geoff's 40 powered model; should loop well at last. Peter Christy's much simplified servo layout on redesigned 'crash' victim; basis for the Lark 2-25 servo layout??? Mar 76 and 'Official' prototype 40 size 'linnet' conversion. Noted as just about ready so what happened? The linnet body kit was introduced along with a revised rear fin but no forty size upgrade. From comments picked up it would appear that the handling was extremely difficult especially tail control and that it would require more revisions of the airframe in order to accommodate the extra power and give handling 'mere mortals' could cope with. Tips and Mod's - 1978 magazine article on how to improve the MM Lark. Operation of the lark had highlighted a few areas that needed improvement for either longevity of ease of operation and so the original Lark was developed in to the Lark 2-25. The open tail gears were protected by two plastic covers screwed to the gear casing thus keeping the dirt out and the oil in. 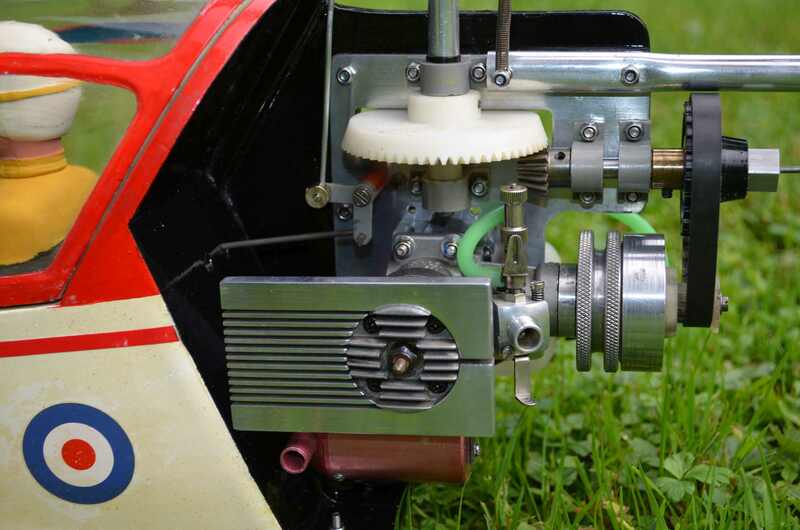 Additionally the tail drive wire instead of a straight coupling into the tail rotor gearbox now incorporated a universal coupling thus removing the chance of drive wire failure due to 'stressing'. The clutch had proved to be weak and thus was enlarged in diameter and also size of shoes thereby preventing premature wear. Finally the body was completed redesigned so as to give a smoother tail control run and to incorporate linkage arms for the throttle control; it was also a much sleeker look. Engine cooling had also been upgraded over the original Lark design and was now achieved by a much more efficient fluted cooling ring instead of the heavier ribbed plate upgrade for the Mk1. Lark 2-25 review - Maurice Tait on building and flying the Lark 2-25 from Feb 79 Radio Modeller. Lark 2-25 review - Bill Burkinshaw on building and flying the Lark 2-25 from Mar 79 RCM&E. Unfortunately, the 25 size engines of the day were proving to be underpowered by those pilots who progressed passed basic hovering and slow speed circuits. Larger engines had been fitted two years earlier but in this configuration it was something of a 'beast' however; now with the modified 2-25 body it was decided to continue this development further. Slough advert showed they were getting into helicopters in a big way and an interesting note is the MM Lark "Linnet" fuselage pack and a 40 conversion; not sure if it was an 'official' conversion as the Berks advert indicated the 40 size model was still in development. Interesting note is that MM were also developing a collective head conversion and a 'rigid' (Flybarless) version. Lark 2-25 with 19 size engine, floats and no Gyro. Not an 'official' version though developed by the Lark designer and also tried by a number of others. Really like the effect of the six blade head and flies well though you can see that it is still quite nervous in cyclic control. As can be seen from the advert the Lark 2-25 was still being produced and sold in the UK. Final production version of the Lark and though it had been rumoured in 1978 that a collective pitch head was in development, it was not to be and so the 2-40 remained with the fixed pitch head. The mounting plates were adapted for the larger engines and the clutch further upgraded being a 'metal to metal' type which did not use a Ferodo lining. Larger head cooling ring and a number of other minor changes were made but the most significant was the use of much thinner chord semi-symmetrical blades made from hard wood. In order to offset the reduced lift of these blades the head speed had to be raised and so the belt drive gear was increased from 8 to 12 teeth. This higher head speed and the use of semi-symmetrical blades gave increased cyclic response and the higher blade loading resulted in better directional stability. Note that the Lark 2-40 requires both the Lark 2-25 Manual and the Lark 2-40 supplement. The Lark 40 was capable of loops and 'barrel' rolls given that it had semi-symmetrical blades and a higher head speed however, it has even been reported that a standard Lark would also do this in the hands of an experienced and confident flyer. Modification to fit a cooling fan. As can be seen from the advert the Lark was still being produced and sold in the UK. however the introduction of the MFA Sport 500 was only a few months away and at £110 for the basic kit would severely undercut the selling price of the lark 2-40 which was over £140. In 1980 Mike Smart who was better known for fixed wing models produced a conversion kit for the Lark thus turning it into a 'proper' Hughes 300 instead of the Linnet model which had only a 'passing' resemblance. No further information on this conversion and Mike himself (in 2010) could not remember any other details.